Till the end of October 20, 2017, The Center for Human Resource Training & Enterprise Cooperation of TDC will receive applications for the 2017 HEEAP Technical Female Students Scholarship from female students who are studying technical majors at TDC. The majors include Automotive Engineering, Mechanical Engineering, Electrical – Electronic Engineering, and Automation Technology. The scholarship is co-sponsored by Intel Vietnam, USAID, Arizona State University, Siemens, Danaher, Cadence, National Instrument, and Pearson Corporation. 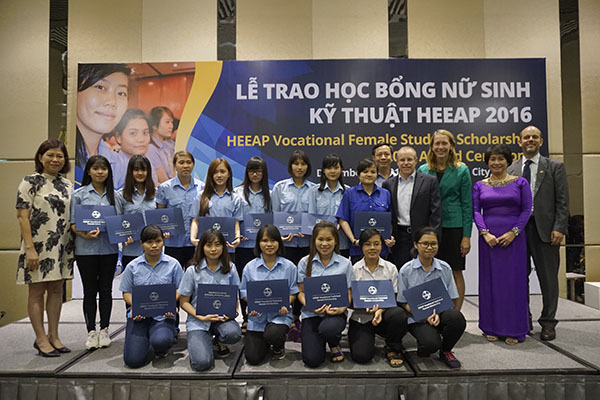 It has been implemented for many years, aiming at vocational female students in 13 universities and colleges in Ho Chi Minh City and other provinces. From 2012, TDC female students have continuously received this meaningful scholarship, which costs about 6.500.000vnd/year/student. Have good results in their studies (for second and third year students) or high score in the entrance examination (for first year students). Actively participate in outdoor and social activities, academic contests at school, national, and international level. Have financial difficulties with the confirmation from local authorities (as a priority). Are not official employees of Intel or any other organizations. Students should contact their faculty’s office to complete the application forms and other necessary documents. See further information about the scholarship: https://heeap.org/scholarship/technical-vocational-female-student-scholarship-2017. © Copyright THU DUC COLLEGE OF TECHNOLOGY.